too strong”, or “just normal coffee thanks”. Think again. 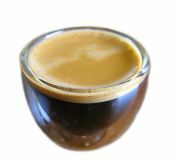 Your Americano, cappuccino, flat white, caffe latte, mocha latte -All made from Espresso using the Espresso Machine. You see Espresso is the base of all these great café-style coffees. It’s what you ADD TO THE ESPRESSO that creates your drink of choice. So, tell me about this Espresso thing then, you say. You create Espresso (a small amount of concentrated brew) by extracting hot water under pressure through ground roasted coffee beans. Espresso is created through the act of forcing water heated to between 88°C and 94°C through 8-9g (for a single shot) or 16-18g (for a double shot) of finely-ground roasted coffee at 9 bar (atmospheres) pressure to yield 25-30mls (for a single shot) or 50-60mls (for a double shot) of espresso coffee within 25-30 seconds. MISCELA Mix/Blend of coffee beans: The purpose of a blend: to mix coffees of different origins to create a balanced result of good body and full of great flavour. MACHINAZIONE The Grind of roasted coffee beans: Beans can be ground anywhere from fine to course, depending on the intended use. Espresso grind is finest, plunger grind is coarsest. MACCHINA The correct use of the Espresso Machine. This includes regular maintenance and cleaning. MANO The skill of the barista preparing the espresso. To make great coffee which will keep you addicted for more, all it actually takes is curiosity and practice. Without my morning coffee. I’m just like a dried up piece of roast goat.